1.1. The following General Terms and Conditions (hereinafter referred to as “GTC”) shall apply exclusively to the business relationship between Checker Demon Press, owner: Luke Atkinson, Alarichstraße 21, 70469 Stuttgart, Germany (hereinafter referred to as the “Seller”) and the customer (hereinafter referred to as the “Customer”) in the version valid at the time of placing the order. 1.2. Should you have any questions regarding your order (e.g. invoicing, delivery status, etc.  ), please contact us from Tuesday to Friday, between 10:00 and 16:00 by telephone on 0049 (711) 816286 or by email at: info@checker-demon-tattoos.de. 1.3. A consumer within the meaning of these GTC and the withdrawal policy is any natural person who concludes a legal transaction for a purpose, which cannot be attributed to his commercial or self-employed activity. 1.4. Deviating terms and conditions of the Customer shall not be accepted, unless their validity has been expressly agreed by the Seller. 2.1. The presentation of products in the online store does not constitute a legally binding offer, but merely an invitation to place an order. Performance specifications in catalogues and websites of the Seller should not be construed as an assurance or guarantee. 3.1. The Customer can choose from the range of products offered by the Seller and place the selected items in a shopping cart by clicking on the “add to cart” button. On the shopping cart page, the Customer can click on the “proceed to checkout” button in order to complete the order. 3.3. Next, the Seller will send the Customer an automatic confirmation of receipt by email detailing the Customer’s order, which the Customer can print out using the “Print” function (order confirmation). The automatic confirmation of receipt merely confirms that Customer’s order has been received by the Seller and shall not constitute acceptance of the order. The purchase agreement shall only come into effect if the ordered product is dispatched or handed over by the Seller to the Customer or if the dispatch of the goods is confirmed by sending an invoice or an express order confirmation by another email within 3 days of placing the order. 3.4. Should the Seller accept advance payments, the contract shall come into effect upon provision of the bank details and request for payment. If the payment is not received by the Seller within 10 days of sending the order confirmation despite a second request for payment, the Seller shall rescind the contract with the result that the order will be cancelled and the Seller relieved from the obligation to deliver. The order shall then be deemed completed without any further consequences for the buyer or the Seller. When paying in advance, goods can only be reserved for a maximum period of 10 calendar days. 4.1. All prices quoted on the Seller’s website are inclusive of any applicable VAT and exclusive of delivery costs. 4.2. The delivery costs are clearly communicated to buyers on a separate information page in our online store and as part of the ordering process. 5.1. Where payment in advance has been agreed, the goods shall be delivered after receipt of the invoice amount. 5.2. If the Seller does not have all the ordered products in stock, he shall be entitled to make partial deliveries at his own expense insofar as this is reasonable for the Customer. 5.3. After three unsuccessful delivery attempts caused by circumstances attributable to the buyer, the Seller shall be entitled to rescind the contract. Any payments already made shall then be refunded to the Customer without undue delay. 6.1. The Customer can select the mode of payment from the available payment methods during the ordering process and before completing the order. Information about the available payment methods is provided to customers on a separate information page. 6.3. Where customers are paying per invoice, the payment must be made within 14 days of receipt of the goods and the invoice. In the case of all other methods of payment, the payment must be made in advance and in full. 6.4. Where third-parties (e.g. PayPal) are tasked with payment processing, their general terms and conditions shall apply. 6.5. If there are differences in delivery times for the ordered products, a single invoice will be issued for each partial delivery. 6.6. Where the delivery and billing address are identical, the invoice shall be enclosed in the delivery. Where the order is delivered in multiple shipments, the invoice shall be enclosed in the main delivery. If the delivery address differs from the billing address, the invoice shall be sent by email as a PDF document to the email address specified during the ordering process. The invoice can also be sent by post upon request. 6.7. If a calendar date has been specified for payment, the Customer will be in default if he fails to deliver by that date. In this case, the Customer shall be obliged to pay the statutory late-payment interest. 6.8. The Customer’s obligation to pay late-payment interest shall not preclude the Seller’s right to assert further late-payments claims. 6.9. The Customer shall only be entitled to offset claims, if his counterclaims are legally established or undisputed by the Seller. The Customer may only withhold payment if all the relevant claims arise from the same contractual relationship. 7.1. The Seller shall retain title to any supplied goods until they have been paid for in full. 1.1. The warranty shall be governed by statutory provisions. 9.1. The following exclusions and limitations of liability apply with regard to Seller’s liability for damage compensation, notwithstanding the other legal claim requirements. 9.2. The Seller assumes unlimited liability if the cause of the damage is the result of intent or gross negligence. 9.3. Furthermore, the Seller assumes liability for the slightly negligent breach of significant duties, whose breach places the achievement of the purpose of the Agreement at risk, or for the breach of duties whose fulfilment generally enables the execution of the Agreement and on whose compliance they regularly rely. However, in this case, the Seller shall only be liable for the foreseeable damage that might typically occur under the Agreement. The Seller is not liable for the slightly negligent breach of duties other than those stated in the above-mentioned sentences. 9.4. The above-mentioned limitations of liability do not apply for loss of life, bodily injury or damages to health for a defect after assumption of a guarantee for the nature of the product and for fraudulent concealment of defects. Liability pursuant to the Product Liability Act remains unaffected. 9.5. If the Seller liability is excluded or limited, this also applies for personal liability of its employees, representatives, agents or assistants. 10.1. The Customer can print the text of the contract before submitting the order to the Seller by using the print function of their browser in the last step of the ordering process. 10.2. The Seller shall send the Customer an order confirmation containing all details of the order to the specified email address. With the order confirmation, the Customer shall receive a copy of the GTC in addition to the withdrawal policy, information on delivery costs and terms of payment and delivery. While we store the text of the purchase agreement, we do not make it available on the Internet. 11.1. The Seller shall process personal data of the Customer only for the intended purpose and in accordance with statutory provisions. 11.2. The personal data provided by the Customer for the purpose of ordering goods (e.g. name, email, address, payment information) may only be used by the Seller to fulfil and execute a contract. This data shall be treated confidentially and not disclosed to third parties, who are not involved in the ordering, delivery and payment process. 11.3. Upon request, the Customer shall be entitled to receive information about the personal data relating to him stored by the Seller at no charge. In addition, the Customer has the right to correct inaccurate information and to block and delete his personal information, insofar as this does not conflict with any statutory retention requirements. 12.1. Sole place of jurisdiction for contracts with merchants, legal entities under public law or special funds under public law is the court competent for the Seller’s registered office. 12.2. The contractual languages shall be English and German.